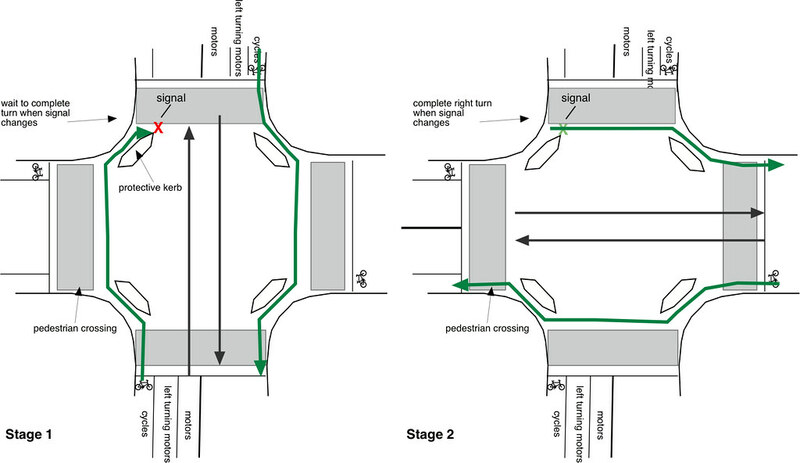 Why not design a signalling system that eliminates the conflicting turns that cause straight ahead cyclists to be cut down by left turning motors? That is, to allow all straight ahead traffic at a junction to go in one signal stage while the left turners go in another. Such a scheme has been described by Rik Andrew of LCC and also by Paul James in a well-ilustrated article in the Pedestrianise London blog under Traffic Controlled Junctions. Rik has presented the scheme to people at TfL and recently they have agreed to trial it at several junctions on CS2. There is a photo of a mock up of the junction in a report in the Evening Standard 6th November 2013 (second picture in the article) and shown below. The text of the article mistakenly says: “the lights will give riders a head start and separate them from left turning vehicles“. The journalist is wrong about the head start! The photo below shows one side of a road during Stage 1 of the signals. In the photo, right turners are allowed to go in the same stage as the straight ahead cyclists, which is wrong because the cyclists going the other way will be put at risk. So TfL’s mock up appears to be faulty! 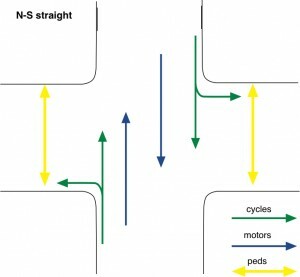 The whole point of the ELH design is that straight ahead cyclists and motors go in both directions in one stage and the turning motors go in another one. 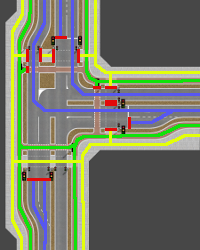 But for this basic variant of the scheme, the road must be wide (at least 18 m). However there are variants e.g. 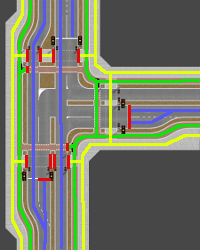 T-junctions and junctions where some turns are barred or some arms are one way and less space is needed. a green signal allows cyclists in the kerbside lane to go straight ahead or to turn left. the fourth, right turning lane should have a red signal. The arrangements for right turning cyclists will be explained later on. Pedestrians cross the east and westbound side roads in Stage 1, so the left turning cyclists must wait after turning the corner. 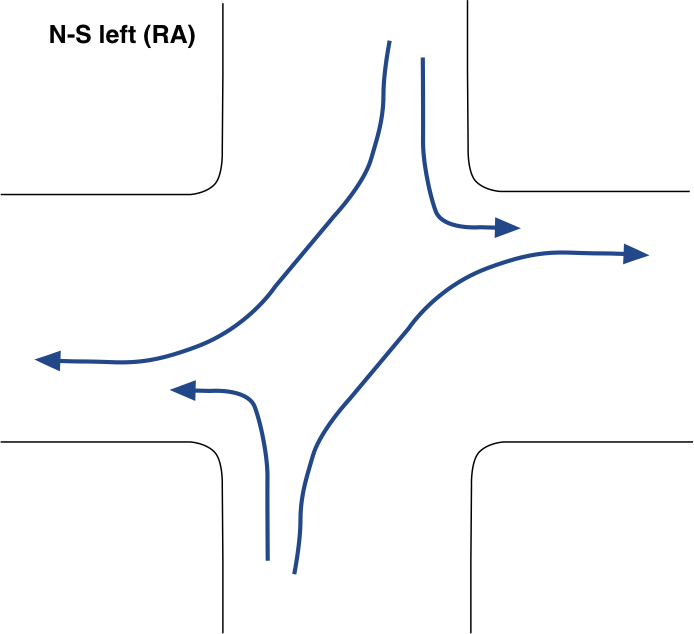 The diagrams below shows all the traffic movements at the junction. Each mode (pedestrian, cyclist, motorist) has it’s own dedicated space. 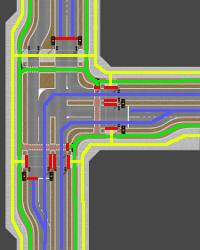 Possible conflicts within motor traffic is removed by having dedicated lanes for each direction and by not having stacking lanes which vanish straight after the junction. 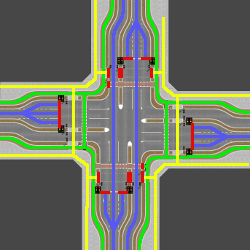 Dedicated lanes per direction allow for the separation of turning movement in time, meaning that each stage of the lights caters to a single direction of travel for all modes. The table below shows stages of the signals at a cross roads junction. The diagrams in the first row are borrowed from Pedestrianise London. Our own diagrams are introduced in the third row. Stage 1 corresponds to the situation in the photo above, but shows both north and southbound traffic. Stage 2 is for the east and westbound traffic across the junction. 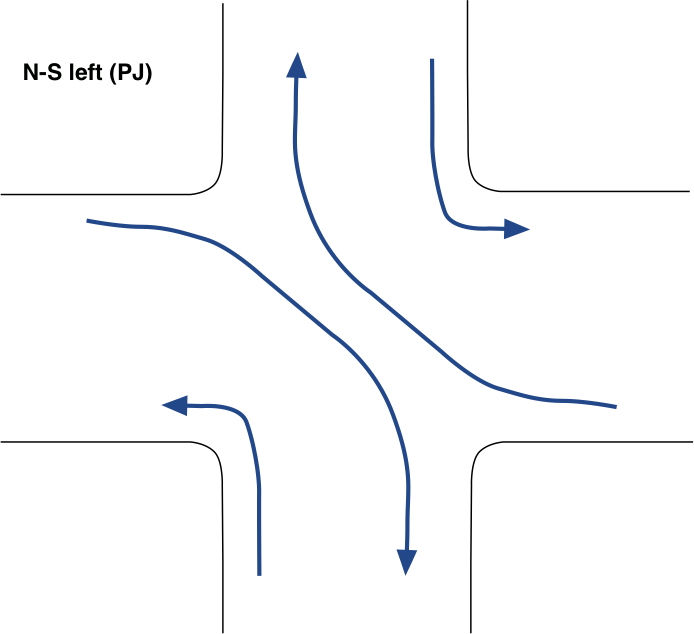 Stages 3 is for the left and right turning motors on the north and southbound roads entering the junction, as described above. 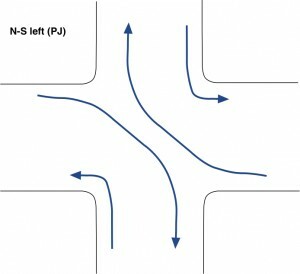 Stage 4 allows for turns on the east and westbound roads. Straight on in one direction (i.e. N-S) and a red signal for the other (E-W). All motor vehicle turning movements are prohibited. Left turning cyclists must give way to crossing pedestrians. The second stage is a reverse of the first, allowing east/west movement instead of north/south. The third stage is a turning phase. 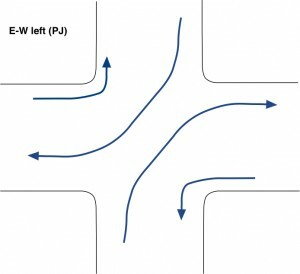 Motor traffic from the north/south turn right while traffic from east/west turns left. The fourth stage allows traffic from the east and west to turn right while traffic from north/south turns left. 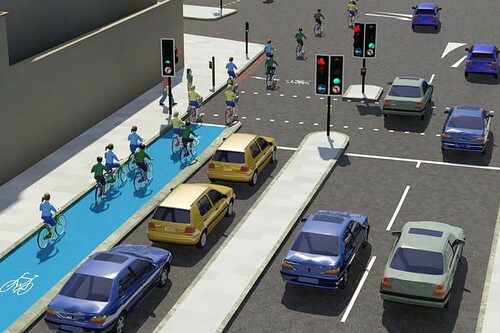 Not only does this scheme eliminate left and right hooks, it also provides cyclists and pedestrians with the same amount of time as the motors crossing the junction. The cycle signal schemes (e.g. as removed from three places on the Camden east-west route through Tavistock Place and Fitzrovia) provide only a few seconds in each round of signals. The ‘early start’ signals proposed by TfL are potentially dangerous and also provide a very poor service. See a critique on LCC website. 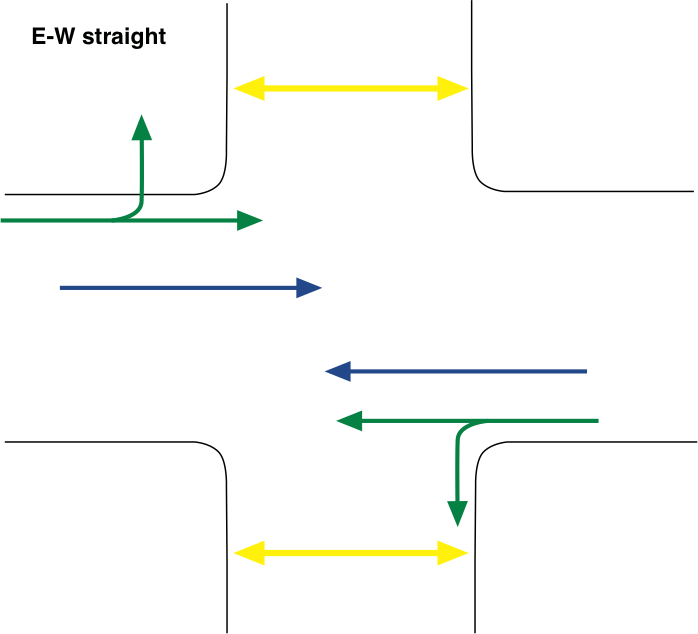 In the diagram below, the two moves when a northbound cyclist turns right are shown with thicker green arrows. Southbound cyclists can perform two-stage rights in a similar manner. The pedestrian movements have been omitted. But this works safely only because the second stage allows the W-E and E-W ahead movements. 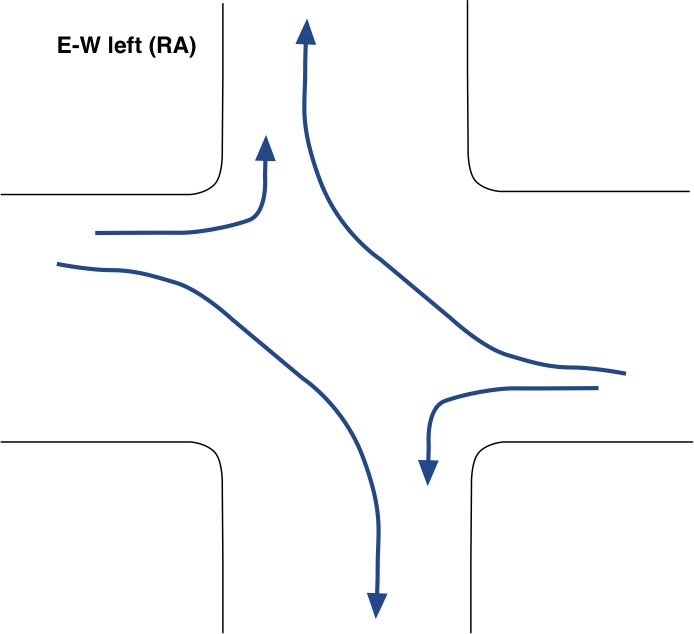 Unfortunately, in this signal sequence, eastbound and westbound cyclists cannot perform two two-stage right turns because their turn in second stage would conflict with turning traffic. 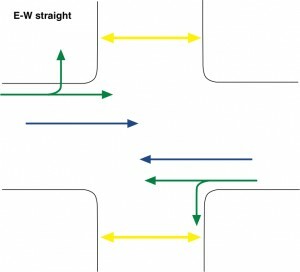 In the first stage of the right turn shown in the diagram to the left, the cyclists wait during stage 2 and then get the green signal in stage 3. Similarly for two stage right from stage 3, the cyclists wait during stage 4 and then get the green signal in stage 3. 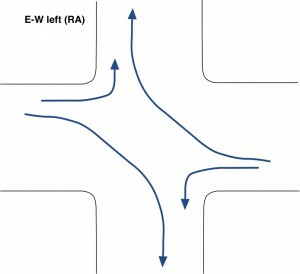 Note that if E-W left had been chosen as the second stage, the cyclists waiting to turn would be at risk of being cut down by the left turning motors. See the video at http://www.youtube.com/watch?v=FlApbxLz6pA that explains Dutch junction design. At each corner of the junction there is a protective kerb and cyclists intending to go straight ahead turn into the side road inside the kerb, then turn right to cross it and then at the other side ride round behind the protective kerb to reach the destination. See for example, the southbound arrow on stage 1 or the westbound arrow in Stage 2 in the figure below. 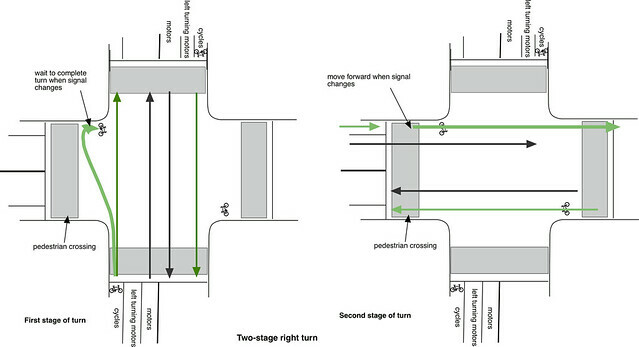 But a cyclist that wants to turn right goes as far as the second protective kerb and waits at a signal (red in Stage 1). They then complete the turn when the light changes as in Stage 2. With the signals at the waiting places, this will work in all stages of the signals, but half the time, the signal doesn’t go green until the third stage of the signals. 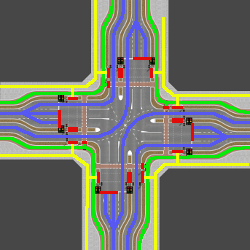 When a cross roads can be converted into a pair of T junctions, the number of potential movements and hence potential conflicts can be reduced. The illustrations of a scheme for a T-junction that avoids all conflicts between cycles and motor vehicles are borrowed from Paul James’ first case study in Pedestrianise London. While motor traffic is travelling straight on through the junction, motor vehicle turns are denied as bicycle and pedestrian traffic also goes straight on. 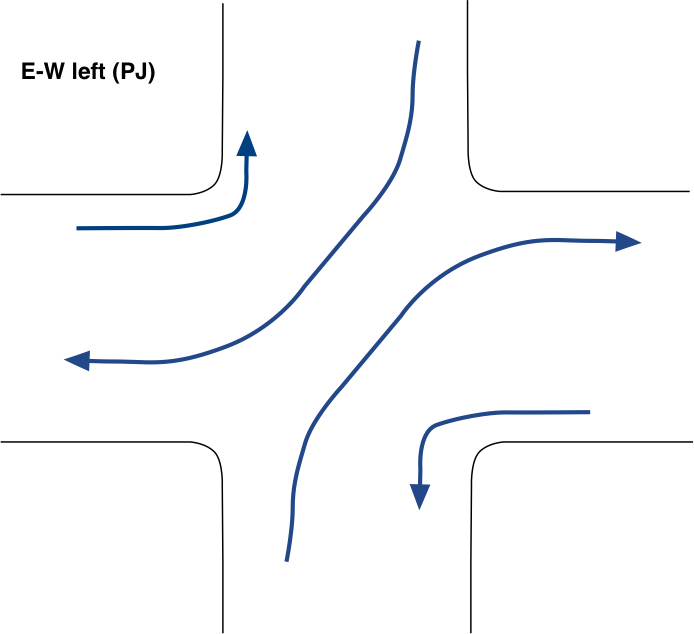 When the right turn phase is happening, motor vehicles, cycles and pedestrians from the main road can turn right, while motor vehicles, cycles and pedestrians on the side road can turn left. In the final phase, motor vehicles, cycles and pedestrians from the main road can turn left, while motor vehicles, cycles and pedestrians from the side road can turn right. Many roads are not wide enough to accommodate three vehicle lanes. 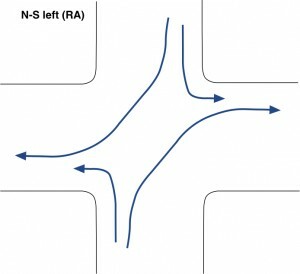 In this case, an alternative solution has been suggested: in each stage, a straight ahead and right turn movement is paired with the non-conflicting left turn movement on the opposite corner of the junction. For example in Stage 1 motors travel from south to north and west and from east to south, while pedestrians and cycles travel northbound. This scheme clearly doesn’t have as much throughput as the one with the separate lane for right turners and wouldn’t be ideal for a junction with a preponderance of straight ahead motor traffic. But another alternative is to consider restricting some of the turning movements which is common anyway at many junctions in inner London. 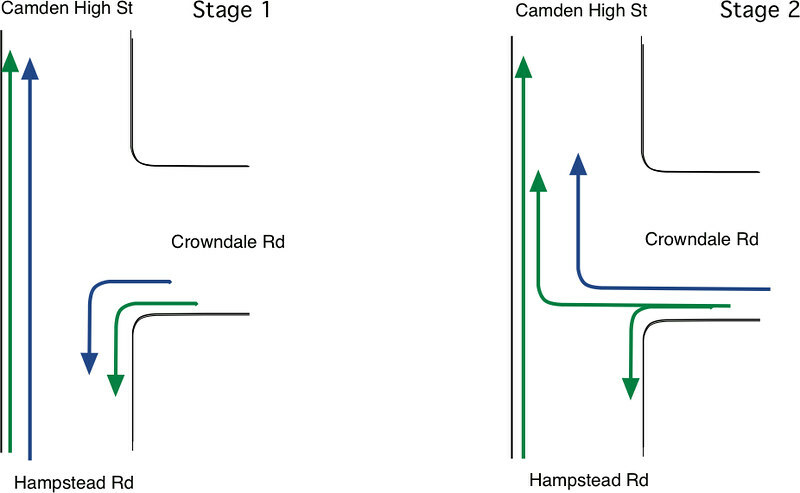 The new proposal for Cobden Junction proposes to convert a rather complicated junction into a pair of separately signalled T-junctions on one-way westbound Crowndale Road, one at Eversholt Street and another at Hampstead Road-Camden High Street using conventional road layout and signalling. The opportunities for left hooks were identified by Rachel Aldred in (http://rachelaldred.org/?p=1692). The following scheme eliminates all of them. It also simplifies the right turn into Mornington Crescent from Hampstead Road as cyclists will turn left into Hampstead Road in a separate stage from the motors making the same manoeuvre. 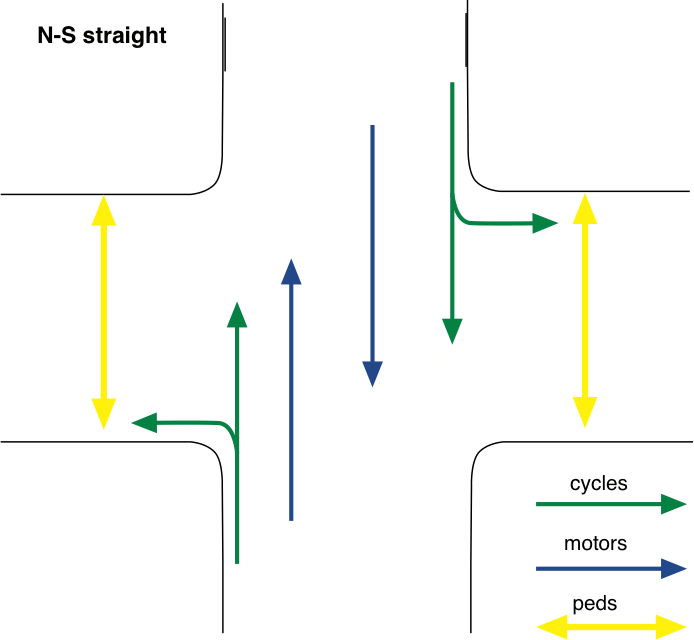 Our diagrams illustrate how contraflow cycling might fit in signal wise. But unfortunately there isn’t room in Crowndale Road east of Eversholt Street for the four lanes shown in our diagram. Camden Cyclists give safety priority over permeability so for the moment, we have relinquished the idea of a contraflow. With one way working the widths of the roads are sufficient: we need about 9m in Crowndale and 10 m in Eversholt Street. Solution 2: merges stages 2 and 3 because would be no conflicts between motors or between motors and cycles. But it does disadvantage pedestrians. With one way working in Crowndale Road we need to separate only left and right turns requiring two motor and one cycle lane (8m width plus separating kerbs). Hampstead Road requires motor lane + bus lane in both directions (10m width plus separating kerbs). Solution 2: merges stage3 into stages 1 and 2 because would be no conflicts between motors or between motors and cycles. But it doesn’t allow for any pedestrian crossings. An all green stage would be required.